Mastering the guitar is hard work. However, maintaining your guitar is easy, and I will show you how to keep your guitar in top shape! Whether you are an aspiring guitar player, or have played the instrument for many years, you know that learning about guitar maintenance can be intimidating and confusing. 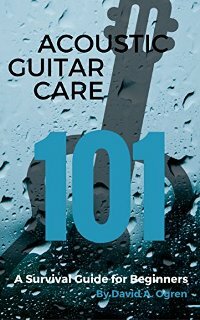 This book offers simple steps to empower you to care for your guitar. Remember all the good times you spent with friends trading exciting maintenance tips? I don’t. It’s not nearly as fun as learning that classic riff from your favorite band, or comparing alternate tunings. You buy a guitar to experience music, not to have another item to care for. However, maintaining your instrument allows you to enjoy the benefits of ownership for many years to come, and helps you avoid many of the hassles; costly repairs and the diminished returns of poor sounding guitars. Often, when you look for a guitar care book, most appear too daunting, too detailed, and too expensive. This book is approachable, simple and affordable.